Someone has kidnapped Shana York, the brilliant young head of York Robotics. 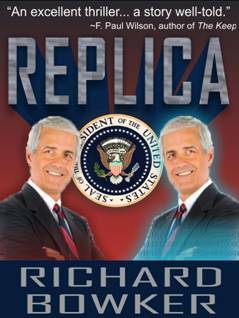 They’ve blackmailed her into creating an android replica of Randall Forrester — the president of the United States. If she fails, the price is death. If she succeeds, it could mean the end of the world . 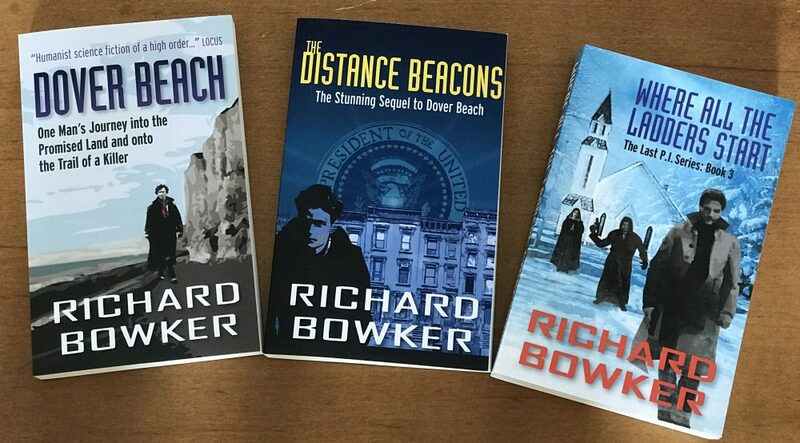 . .
“Bowker’s novel succeeds both as science fiction and as a contemporary thriller. It was the last day of his life, and the man in the blue nylon jacket was getting nervous. He stood on the common, hands stuffed in his pockets. It was a little after two by the town-hall clock. He would be dead by a quarter to three. The crowd was growing now. Lots of Norman Rockwell families: pink-cheeked grandmas, kids in snowsuits clutching balloons, strong-boned women pushing strollers. Plenty of bored, burly policemen. And the occasional gimlet-eyed man in a gray overcoat, watching. The high school band was playing next to the temporary stage; a young woman was testing the sound system; the hot-chocolate vendors were doing terrific business. What better way to spend a Sunday afternoon? He hadn’t expected to be nervous. But everything was real now, and nothing can prepare you for the reality of death. He had parked his car in a supermarket lot at the edge of town. It occurred to him that he could turn around, walk back to it, and drive away. Life would go on. This struck him with the force of great insight. He had been anticipating this day for so long now that the idea of living it like any other day was strange and compelling. Which would be harder: dying, or living with the knowledge that he had failed? But they weren’t willing. And he was. So he had left them behind, to end up here and take the risk. He had been on the road for days. The distance to be traveled was hardly great, but he felt a need to disappear, to find some anonymity in the grimy motels and the self-service gas stations and the fast-food restaurants. Family, lovers, friends, work—it would be easier, he had thought, if he left them all far behind. But here he was, and it was hard. …and there he was! Yes, look, in person—something to tell your grandchildren. Reach out and maybe he’ll touch your hand! The man in the blue nylon jacket stood in the crush and gaped like all the rest. The reality of his prey was paralyzing. The high forehead gleaming in the sunlight as if polished, the sharklike smile, the large nose red from the cold… Look, it’s him! We’re both going to die. Hard to breathe. The anger was returning before the man had spoken a word. How could they cheer him? Why couldn’t they see? Would one of the gimlet-eyed men notice that he wasn’t cheering? The introduction was finished; the cheers continued. The man on the stage waited for silence, then began. Bad joke, gratitude to the crowd for coming out on such a cold January day. Then on to the substance. How could he say that stuff—and how could the crowd listen to it? Inoculated, anesthetized, sanitized, with twice the life-span of their ancestors and half the pain, they didn’t know how good they had it. Maybe they wouldn’t know until they destroyed what they had. The crowd roared. Someone slapped him on the back. He jammed his hands deeper into his pockets. He should be past trying to understand or to argue now. He should just get ready to do what had to be done. As he watched and listened, the speaker’s head seemed to grow until it filled his field of vision. He imagined it exploding, like a ripe melon dropped on concrete. He imagined the screams and the terror, the hands pointing at him, grappling with him; imagined everything as he had imagined it a hundred times before. But he had run out of time for imagining now; reality was here, ready. He had only to seize it. He didn’t move, and the speech continued. Cindy Skerritt. He hadn’t thought about her in years. He wondered how she was doing. Still living in Montpelier? Still fooling around with those stupid Tarot cards? Geez, they had had some good times together. Why did they ever break up? He could be in Montpelier by nightfall. He could turn around, walk back to his car, and drive away. Maybe he could kill the man and still escape. Why not? He wouldn’t miss. He knew he wouldn’t miss. The common was overrun with Secret Service agents. He had even seen one with a robot scanner; they were convinced a techie was going to send out a robot to do the deed. But they couldn’t be everywhere, couldn’t watch everything. He just needed a little distance. He made his way through the crowd out onto the sidewalk. It was full of cops standing next to their cycles, waiting for the motorcade to resume. He crossed the street. A few people were perched on the steps of town hall. He looked around. There was nobody by the Methodist church. He sauntered over to it and turned. He was almost directly behind the stage now, and he no longer had a clear shot. He climbed the stairs and stood in front of the white double doors. He casually tried them. They were unlocked. He opened one a little and stepped back inside. The stage was still visible, his target still there, head bobbing slightly as he reached the climax of his oration. He imagined walking through the streets, unnoticed in the turmoil, getting into his car, driving away. No one would even know he had been in town. Montpelier by nightfall. And a lifetime to enjoy the memory. He took the gun out of his pocket and lifted it into firing position. The crowd was cheering. And the people on the stage were on their feet, applauding, surrounding the man, shaking his hand. The speech was over. He fired and fired and fired. Felt the arm clutching at him, heard the cheers turn to screams, saw the jumble of bodies on the stage, the pointing fingers. Then he turned and faced his attacker. It was a minister, overweight, jowls trembling with fright. Doing his duty even though it meant he was going to die. He knew that feeling. He shrugged off the minister’s feeble grip and shot him in the face. Blood everywhere. Had to get out of here. He raced down the center aisle of the church, taking off his bloody jacket as he ran. The place smelled of furniture polish and flowers. Had to get out. Past the pulpit, through a door, into darkness. His knee banged into something sharp. He cursed and limped ahead. He found a knob, turned it, and saw sunlight. He forced himself to run down the stairs and along the side street. Which way to his car? If he could only get to his car, everything would be all right. He heard sirens, squealing tires. He veered onto the sidewalk and dived into a shop. It was a drugstore, brightly lit, antiseptic. No customers—just a pharmacist, bald, skinny, terrified. He realized he still had his gun in his hand. The clock over the counter said quarter to three. The pharmacist pointed past the shelves of pills. The man hurdled the counter and made his way through a storage room piled high with empty cartons. The door was bolted. He slid the bolt back and wrenched the door open. A dumpster, a car, a chain-link fence with houses beyond. He headed for the fence. The wire ripped his pants, cut into his hands. He didn’t feel it. A Doberman was running toward him. He shot it, then noticed it was on a leash. A woman stared at him from her kitchen window. Had to find his car. The parking lot couldn’t be far. Montpelier by nightfall. Sirens everywhere. Cindy, will you tell me my fortune? His knee was on fire. Couldn’t run much farther. The first shot hit him in the shoulder as he reached the corner. The car wasn’t there. All he saw was flashing blue and red. He stopped and breathed the pure cold air. He wanted to apologize to that woman for killing her Doberman. Reflex. Unavoidable. The second shot hit him in the left buttock. The third and fourth shots hit him in the spinal column and the right kneecap, respectively, and he fell to the ground. The fifth shot smashed through the rib cage and lodged in his heart. The thing of it was, he didn’t know if he had succeeded. And now he would never know.